It’s the busy time of year so I’ll get right to it! These are gifts you can buy for cheap, or make in a flash. 1. Rae Dunn Note Holder and humorous Sticky Notes from knockknock.com. I found the Rae Dunn note holder at T.J. Maxx for much less money than online. I think these are fun teacher gifts. You can fit three of the notepads in the holder. Use a place card holder as a poem or Bible verse holder. Usually, these come in sets, but you only give one per person so it’s affordable. Often, I’ll give people a selection of poems or verses that can be rotated. Here’s a LIST of my favorite poems that I use as gifts. Print them on cardstock. Craft’em up, and you’ve got something special. 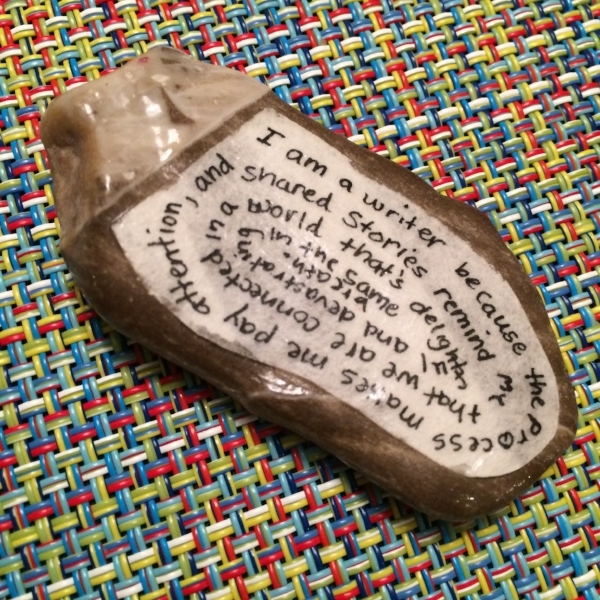 Display inspirational words, phrases, or lines from poems on rocks. If you need one line from a poem, check out Irene Latham’s project, How to Live Your Poem. She collects short lines from poems that are also great advice for living. All you need is a flat, smooth rock, a cheap sponge brush, Mod Podge, a permanent marker, and paper. Cut paper to shape of rock surface, apply a dab of Mod Podge directly to the rock, and then attach the paper. Continue with a couple coats of Mod Podge, smoothing surface of paper with your finger, letting the first coat dry before applying the second. The rock below includes text that’s written in a spiral. The final example is three rocks that go together with lines from a Mary Oliver Poem: to look, to listen, to lose myself, inside this soft world. I put origami paper on first, and then attached the paper with writing on top of it. I love being inspired by these words when I’m in my office writing. Every January, I begin Ali Edward’s One Little Word Project, and I get a salvaged word from Colleen Attara to hang in my house. I am in love with her art. I’ve never met her personally, but I feel like I know her. Every package from this amazing artist is personal and filled with love. I’ve always ordered her plastic up-cycled words, but now I see she’s using salvaged plywood, as well. I also get her salvaged hearts. If you have great ideas and/or variations, share your holiday spirit in the comments. I’d love to be inspired by your ideas, too. I hope you enjoy giving the gift of words this holiday season. P.S. Next week, I’m posting a wonderful writing recipe that will get you all talking about your lists of perfect things - a conversation sure to please any palette around your Thanksgiving table. 3 Journals I Love on Live w/ Lorrie!